Whisky merchandise like scarfs, hats, polo shirts and more. The Ardbeg Wordle T-Shirt Men is a black Ardbeg t-shirt with the logo printed on the left chest, ..
Caol Ila scarf with black and brown stripes ..
Green Classic Malts Selection polo shirt with the yellow logo on the left chest. 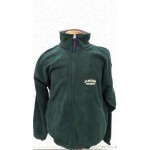 ..
A Jameson Irish Whiskey fleece vest with the Jameson logo embroided on the breast. Size XL. 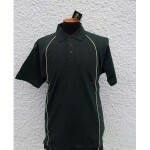 ..
A Jameson Irish Whiskey polo shirt with the Jameson logo embroided on the arm. Size XL. ..